Guys, I’m ready to kick off this long weekend, so I hope you’ll allow me some brevity here…the better to get back to celebrating. A little How is it already the end of the month already? and a Whew, is it hot or what? and…yes, yes, I think we’re good. So! Let’s get into it already, shall we? I’m very into “casual summer shoes” right now. Is that maddeningly vague? Probably! But I just can’t decide. I’m an equal opportunity casual shoe enthusiast. 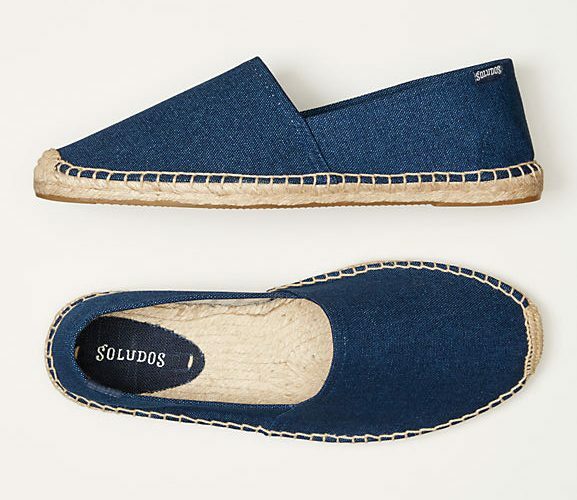 Espadrilles. Sneakers. Boat shoes. The works. Maybe it’s because I tote a laptop around with me everywhere I go, so I’VE been wearing exclusively casual (flat) shoes. For you guys, we’ve featured them here and here and here, and I’m just…I’m into them, okay?! By now, it’s been pretty well hammered into my head that it’s diet, not exercise that will be the difference in shedding the last bit of weight you may be trying to get rid of. As someone for whom convenience outmuscles self-control most of the time, it’s important that I have healthy options at arms reach when I come home from a full day at 8 or 9, starving and ready to eat asap. Kettlebell Kitchen is a new service I’ve tried that puts together ready-to-eat meals that are protein and veggie-heavy…carbs not so much (though they do have an “athlete” version of all their weekly meals that do involve some “good for you” carbs..whatever those are). If you’re in NYC, it’s easy enough to have delivered, or to pick up at one of a bunch of gyms and training studios, if you’re cheap like me and want to skip the delivery charge. Because it seems like it took forever for summer to actually hit, I didn’t start getting antsy to shop for new summer wardrobe additions (save for the aforementioned casual shoe) til just now. If you’re also in the mood to test your credit card’s resiliency, you can’t go wrong with a few lists. Our pal Beau put together a list of all the gear you need for the end of June, which is thoughtfully comprehensive. The new DJ Khaled album came out, and I was decidedly whelmed by it. It was fine. It wasn’t great. It was really long. Wild Thoughts is fine. Not great. Definitely not a banger. Or a bop. I also did not fall in love with Drake’s “collaboration” with Louis Vuitton? on a song? I mean, if it was a sneaker, or a coat, maybe. But a song? Oh man guys. GUYS. Have you watched The Good Place? I totally skipped this NBC show when it premiered last fall because it just seemed…kind of weird. A chick (Kristen Bell) dies and goes to heaven on accident even though she was the worst? Not my thing, you know? But then I got caught up on Silicon Valley and was waiting for a new episode of Casual and thought, what the heck? And it. Is. Great. It is also super weird, but if you can roll with giant shrimp falling from the sky, you’ll probably like it. It’s also cool that it’s written and produced by some of our contemporaries, folks like Joe Mande, Jen Statsky, and Megan Amram, all of whom I follow on Twitter and while we’re close in age, seem to be much more accomplished than me – which, depending on the day, gives me comfort or despair. I don’t know why, but I always imagine television shows being made by 45-year old white men, so it’s nice to know that’s not all that’s out there.